The Global Commission on Drug Policy will host a live press conference and teleconference on Thursday, June 2 at the Waldorf Astoria Hotel in New York City to launch a new report that describes the drug war as a failure and calls for a paradigm shift in global drug policy. The Commission is the most distinguished group of high-level leaders who have ever called for such far-reaching changes in the way society deals with illicit drugs – such as decriminalization and urging countries to experiment with legal regulation. The Executive Director of the global advocacy organization AVAAZ, with its nine million members worldwide, will present a public petition in support of the Global Commission’s recommendations that will be given to the United Nations Secretary General. 'Avaaz—meaning "voice" in several European, Middle Eastern and Asian languages—launched in 2007 with a simple democratic mission: organize citizens of all nations to close the gap between the world we have and the world most people everywhere want. "We call on you to end the war on drugs and the prohibition regime, and move towards a system based on decriminalisation, regulation, public health and education. This 50 year old policy has failed, fuels violent organised crime, devastates lives and is costing billions. It is time for a humane and effective approach." The preamble text notes that the campaign is timed to coincide with the launch of the Global Commission on Drugs report (produced by 'heads of state and foreign policy chiefs of the UN, EU, Brazil, Mexico' ), set to make similar recommendations next month. The campaign is seeking to get 1 million supporters - something that AVAAZ, with more than 8 million subscribers is more than capable of achieving (all were emailed today - and as we write the total is already over 100k with many more signing every second). Petitions can often be ineffectual, but something of this scale, at this key juncture in the debate can have a real impact so we urge all our readers and supporters to help promote this initiative around their contacts and networks in any way you can. There can be no question that global security is fundamentally compromised by the world’s commitment to the war on drugs. Could this fact be instrumental in bringing an end to the global prohibition? As has been demonstrated by the recently launched Count the Costs campaign, the war on drugs detrimentally impacts on numerous policy areas – Crime, Development, Security, Health, Expenditure, Stigma and Discrimination, Human Rights and the Environment. Some of these policy paths have been well-trodden by reformers; others have witnessed almost no footfall. Whilst all of them have the potential to engage policy makers, the question we have been asking is, which of them has the potential for the most engagement and concern? We have come to the conclusion that demonstrating the negative impacts of the war on drugs on security, and bringing security and intelligence agencies into the debate, has substantial untapped potential tomove the debate forward. When current and former military and intelligence personnel critique the war on drugs or indeed, explicitly call for reform to the status quo, formerly uninterested policy makers are likely to pay attention. Up until relatively recently it had been received wisdom that drugs, crime and insecurity were inextricably linked. As the reform agenda gains traction, it is increasingly understood that the drugs/crime nexus is created, not by primarily by drug use/misuse, but in substantially part by the the prohibtionist policy environment; the war on drugs itself. 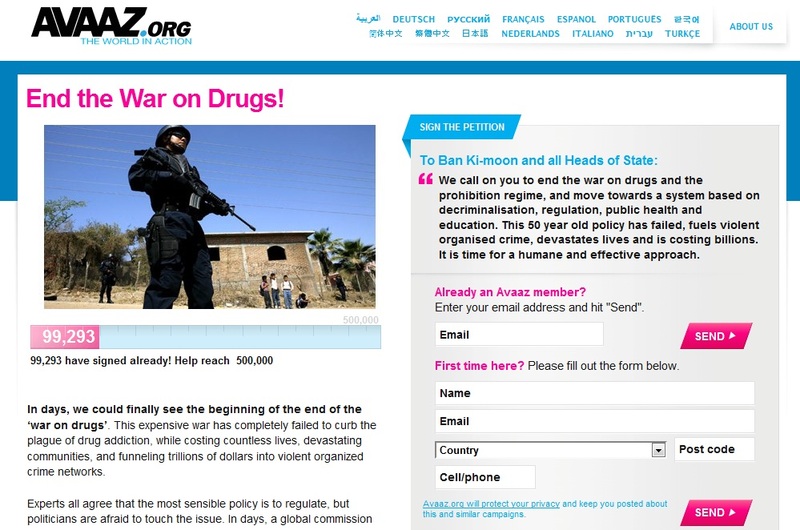 In 2008 even the head of the UN Office on Drugs and Crime conceeded in a discussion paper that prohibition had created a series unintended negative consequences, including 'vast' criminal market. However, there is relatively little engagement in the public debate with the fact that, along with the vast criminal market there are whole regions of the world whose national security is fundamentally compromised by the war on drugs. There have been lone voices – for example David Passage (former director of Andean Affairs at the US State Dept), Eliza Manningham Buller (former Director General of MI5), and there is some literature. Notable amongst them is Chasing Dragons. But now the security issue is emerging, blinking into the sunlight. In October 2010, (entirely by coincidence) NOREF, the Norwegian Peacebuilding Resource Centre and the International Institute for Strategic Studies (IISS) both ran workshops exploring the connection between drug trafficking and security. Papers from NOREF are available here, here and here. A wide ranging discussion explored the scope of the drugs and security connection, including contributions from Dr. Mohammed Zafar Khan, Former Deputy Minister, Afghan Ministry of Counter Narcotics, Sanho Tree from the Institute for Policy Studies, the Colombian Ambassador to the UK, and others. The discussion effectively took place on two levels with some engaging wholeheartedly with the question of the impact of prohibition upon security and others remaining in their comfort zone by effectively giving country reports of security impacts. Workshop 2, 19 April 2011: Participants and agenda. It attracted participants from a wide range of countries, organisations and agencies, including representatives from the UK (Serious and Organised Crime Agency, FCO), Russia, China, and Mexico. Many participants found the blue skies element challenging (as you would expect from officials who spend their lives working within the prevailing paradigm of prohibition). Despite being invited the Americans were notably absent from the workshops – a glaring gap, given the US’s deep and abiding commitment to maintaining the status quo. There are many potentially fruitful policy veins that remain untapped. For example the development world has been reluctant to involve itself in the reform agenda. But members of the security field appear only too willing to get stuck in and are to be congratulated for doing so. There are those who have expressed concern that engaging in the security agenda has significant risks, not least of which is that it could further solidify the security-oriented regime and discourse. We are not naïve enough to forget that some significant security and intelligence fiefdoms are predicated on and resourced by the commitment to a global war on drugs. Indeed for some it is their very lifeblood. However, our experience thus far is that some in the security and intelligence world are willing to play their part in exposing the tragic irony of the overwhelmingly negative impact of the war on drugs on national, international and human security. 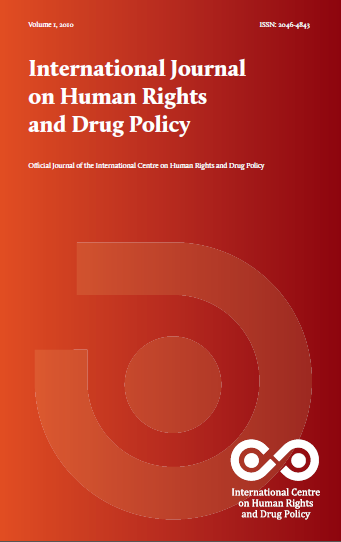 The first edition of the new International Journal on Human Rights and Drug Policy is now available online in full. 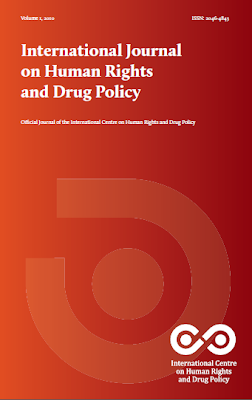 Produced by the International Centre on Human Rights and Drug Policy the journal critically engages with many of the frequently neglected human rights issues raised by drug policy and law enforcement. It is also open access, so available to all. Highly recommended. Y. McDermott, Yong Vui Kong v. Public Prosecutor and the Mandatory Death Penalty for Drug Offences in Singapore: A Dead End for Constitutional Challenge? Public Meeting: War on Drugs - or Time for Peace? On Friday 13th May, Professor David Nutt and Danny Kushlick will take part in a discussion on drug policy at Cotham School, Bristol. Join us from 6.30pm.